Managing student housing units efficiently, yet cost effectively is challenging. There is plenty to worry about without having to spend time and money to manually monitor areas of a building that could be monitored by sensors. Monnit has developed a low-cost wireless sensor solution for monitoring buildings and properties on college or university grounds. Monitoring boiler temperature output and pump motors. Monitor HVAC systems for proper temperature operation. Detecting plumbing leaks and/or pipe breaks in colder weather. Track access to building areas. Voltage Detection Sensors Can detect if a pump or other electrical device is active. Keep your students safe and warm by using Monnit wireless sensors. With the latest Monnit Ethernet gateway firmware update and release of the latest iMonnit Express – PC software, Ethernet gateways can now be used to locally monitor wireless sensors on a computer without needing an Internet connection. 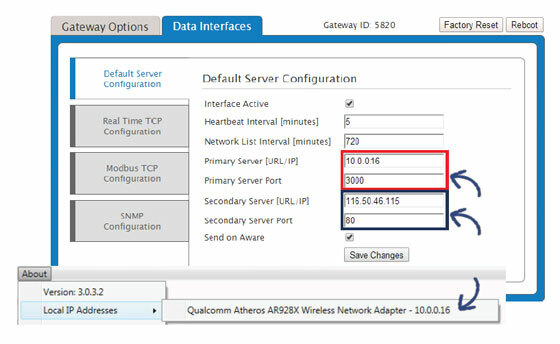 In order to use an Ethernet gateway with the PC application, you will need to make sure that both the gateway and PC are connected to the same network, and configure the gateway to talk directly to the computer software instead of using the Internet. When you purchase the iMonnit Express software you receive an activation code. Visit http://www.monnit.com/support/downloads/ to download and install the iMonnit Express software. When you finish installing the software launch the program and click on “Configuration” then “Enter Key”. Enter your key in the box and click “Activate”. Next you will need to add your Ethernet gateway and any sensors you wish to use with the software. Click on “Configuration” and choose “Add Gateway”. 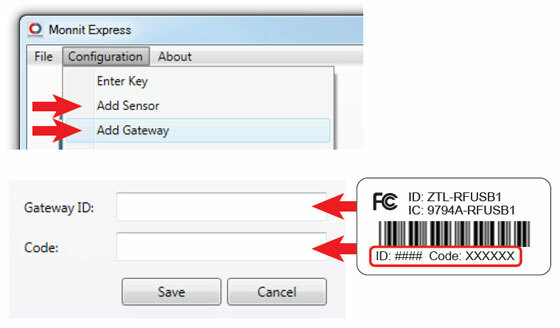 Enter the Gateway ID and Code from the label on the bottom of your gateway. Click on “Configuration” and choose “Add Sensor”. Enter the Sensor ID and Code from the labels on the bottom of your sensors. Before configuring the Ethernet gateway, you will need to identify the IP address of the PC you are using. In the iMonnit Express software, click on “About”, then “Local IP Addresses” and make note of the IP address that your computer is using on your network. Connect the Ethernet gateway directly to the Ethernet port of your PC using a standard Ethernet cable. flash red. Release the button and the device will enter local configuration mode. Click on the “Data Interfaces” tab. and use 3000 as the default communication port, then click “Save Changes”. When finished, click the “Reboot” button on the top right side of the page to restart the gateway. the computer running express) and power the device on. The lights will flash and go solid green when the gateway connects to the Monnit Express software. In iMonnit Express, check that the gateway status has changed to active. You are now ready to insert batteries into your sensors and begin using the software.